Today, the big news is that Skype has released a new version of their iOS app that now included video conferencing. You may be saying, “I have a iPhone and it has FaceTime already”. Yes, that is true, but it only works over WiFi and the desktop side is rather limited… Apple will ‘fix’ all that but for now we have Skype already ‘there’. Skype on the iPhone (iOS 4.x versions) allows for Video chat over 3G and WiFi. It works in landscape and portrait, and there is full coverage for PC and Mac desktops. Since the iPad doesn’t “currently” have a camera, you can still use the Skype app but it just wont broadcast your picture to the people on the other end. So, you can see and hear them but they can only hear you. That is still way better than what we had yesterday, no video either way. A feature many of us use now and will continue to use is the Chat feature. 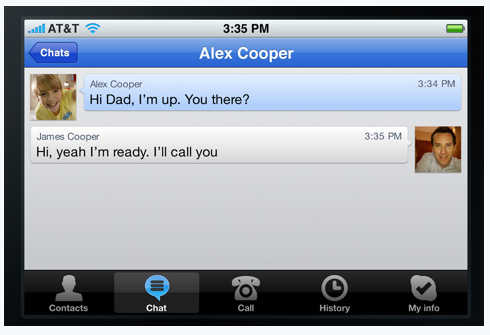 With iOS 4.2 on our iPads, Skype will stay open in the background while you work in other apps. People can sent you a chat text and the Skype app will alert you that there is a message. Very handy when in a meeting and someone can’t wait for you to check your email. As with any multitasking app, it will stop looking for incoming chat messages though after a while so you do have to visit the app from time to time to keep it alive. With rumors around higher resolution screens, cameras and better external speakers on iPad 2 early next year… Skype will be our mobile video phone. Flip to the external camera when you want to share with others where you are live rather than emailing a picture… fun! For work though, Skype with video has pulled our worldwide employees together for next to no money out of pocket.